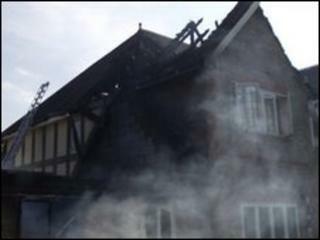 Compost which set alight when it overheated has seriously damaged a house in Buckinghamshire. The compost heap was in the grounds of a property in Gerrards Cross and caught fire because of a build up of heat, a Bucks fire service spokesman said. Flames destroyed a double garage, shed and the roof of the house, while damaging the first floor. No-one was injured and a hamster was rescued by firefighters during the fire on Tuesday afternoon. Station manager Keith Williams said: "Although the cause of this fire is unusual, it is not as rare as it sounds, particularly during prolonged periods of warm weather. "We would like to draw people's attention to this to warn them of the importance of choosing a safe site for composting." Turning compost over regularly and keeping heaps away from sheds, fences and other structures will limit the danger, he added.